Students will explore character, plot, and theme and learn to write persuasively as they develop a movie-style trailer for a book they have read. Between iPods, cell phones, portable game consoles, and TV, kids are spending less time reading than ever before. The local public library is looking for a way to promote reading to elementary students. They have asked you to create a short digital booktalk – like a movie trailer for a book – that they can use in the children’s section of the library. Big Idea: How do I get a young reader hooked on a book? Getting students to read isn’t always easy. Choose one of your favorite books and share it with your students in a way you think will get them excited about reading it. Then, tell why it was your favorite book. Ask students what gets them excited about reading. Is it the characters? Is it the setting, an exciting plot, interesting themes, or a personal connection with the story? Let your students know they will be using Wixie or Frames to create a booktalk in the form of a movie trailer to promote one of their favorite books. Have I read another book by the same author? Did I like it as much as this book? Is this a book part of a series? Do I have a personal connection to this book? To better advertise their book, students need to be able to identify the theme. Themes are the fundamental and often universal ideas explored in a literary work. They are BIG ideas, like friendship, love and courage. For example, when a character stands up for a friend in a story, we can infer from their actions that friendship and courage are themes in the story. As a class, explore how authors use themes to guide their writing. Ask students to reread important parts of the book and take notes as they analyze the book’s characters, setting, and plot to determine the theme. The actions of the main character are a great place to look for the theme. To gather information students can use to develop their booktalk, use graphic organizers like thought webs and the 5 W’s to show the central theme of the book as well as events in the story that relate to the theme. A vivid description of an event that supports the theme. The title and name of the author at the conclusion. 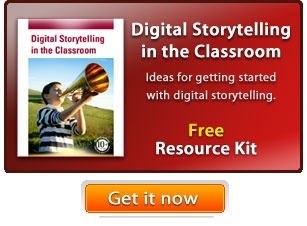 Remind students that showing the story is more effective than trying to retell the story. As they write the script, have them think of the booktalk as a movie trailer. Their goal is to leave the viewer with a compelling reason for checking out that book! To transform the script into a video, it is helpful to have a storyboard or map of each student’s vision. The storyboard should include information about which portion of the script each scene will include and what images and sound files will be used to support it. When the storyboard is complete, have students begin gathering images, music, and sound effects to support their vision. Have students use Wixie or Frames to build their booktalk. They can use images from Pics4Learning, or illustrate using the paint tools to create their own images. They should record their script, add sound effects, or background music to match the tone and purpose of the booktalk. Share the book trailers with the rest of the class or play them on the morning announcements to encourage others to read the books. The librarian may choose to show the trailers in the library as other classes come in for their scheduled library time. If your district or community has public access television, try to get your students’ booktalks aired. This is a great way to encourage the entire community to read! The final booktalk is a great summative assessment of student skill communicating in a visual medium. During the process, you can assess progress using students’ notes and thought webs. Having students turn in their scripts and storyboards prior to creating the booktalk animation will help ensure that they are on the right track. You may also want to look at time management strategies and help students develop a project calendar.